The Tasc generator 5000 is bought from Grebthar the Hammer for one platinum in Shores of Darkness. It allows to activate quests (KDQ quests) with James the Roche once every 20 hours. 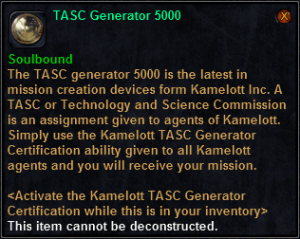 It allows to use the ability called Kamelott TASC Generator in general tab of the ability window. This page was last modified on 6 December 2011, at 17:14.